The 50″ Extra Large Heavy Duty Dog Crate is a collapsible crate. It is the largest collapsible heavy duty dog crate available on the market today. This extra large dog crate is a huge 50 ¼”D x 34 ½”W x 36 ½”. We also have a smaller size for Pit Bulls and other small to medium size strong dogs. That size is 38D 1/4 x 30 1/4W x 32 1/2″H. This crate brings with it a 3 year manufacturer’s replacement warranty. If your dog breaks it, we will replace it! Why would you need a crate this large? Large breed dogs can simply walk out of their big box store wire crate when they are done being confined. You won’t know when this will happen. It occurs at different times depending on the dog’s temperament and willingness to please their owners. They can chew, push or just blow the door off when they’re ready. Here’s a list of large breed dogs that will typically fit in this size crate. Strong Enough to Hold Anything you’re Strong Enough to put in it! NOTE: Always be sure to measure your dog before ordering any crate. With these heavy duty crate the freight cost is very high. You will want to get the right size crate the first time. What makes this heavy duty collapsible crate so strong? The Wire Mesh: 6 gauge welded steel wire. 6 gauge wire is slightly more that 1/8″ in diameter. This is a very strong wire in itself but when two 6 gauge wires cross, there are spot welded to create the wire mesh. At the crossover points you now have a full 1/4″ of wire. A 6 gauge welded wire panel makes for a super strong wall for containment. The parts are welded everywhere metal touches metal. The wire is welded to the tubular frame. Since it is a collapsible crate the frames are fastened with 8 bolt and nut sets supplied. The hole size of the mesh is 2″ x 4″. This may or may not cause a problem if you have a chewer. If your dog bites down on this 6 gauge wire, it won’t move. I’ve not heard of this being an issue in the larger breeds but be advised and watch your dog for the first few days. This crate does not fold up. When the 8 bolt and nut sets are removed you have a stack of panels which can be loaded into a car, SUV or truck. Upon arrival at your destination simply reassemble the crate and your dogs crate is ready to go. The weakest part of many crates is the door. The dogs seem to recognize this. The door on your new collapsible steel crate is on the end of the crate. This makes it so easy for your big dog to simply walk in and out of the crate. There’s no stepping up and in. The door is made of the same exact materials as the rest of the crate and just as strong. Your collapsible crate is secured using a carabineer or a padlock. It’s simple, easy and straight forward. The floor is 16 gauge aluminum diamond plate. It’s easy to clean and with door access on the end getting in and out is simple and easy. Your entire collapsible crate is galvanized for rust resistance and long life. Assembly is easy with only the 8 bolts to assemble or disassemble this durable crate. Once collapsed and the panels stacked the height is just short of 8″ high. This simplifies storage and transport. Your new heavy duty indestructible escape proof collapsible dog crate comes with a 3 year manufacturer’s warranty. If your dog breaks it, we replace it. Why would a manufacturer put such a long warranty on a crate? Simply because we know that you dog will not be able to break this crate. Your dog will not be able to chew or push out of this crate. It really is just that simple. Your extra large heavy duty dog crate needs 7 calendar days to produce, package and load on the UPS truck. Add to that and you will see that the lead time is generally 10 days to 2 weeks. The freight cost is $100 to anywhere in the contigous lower 48 states. For more information and for ordering please visit CarryMyDog.com. Lastly, we know heavy duty dog crates are expensive. 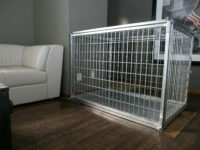 Please consider and compare the price of this extra large heavy duty dog crate to a Vet bill for dental work after chewing through their light duty wire dog crate or the price of a new couch, or surgery to remove something your dog swallowed after his escape from his light duty wire crate. The list goes on so I will leave the rest of the list to your imagination. Again, this will be the last crate you will ever need. How to crate train a puppy: Thanks for your comment. I try to bring usable information to my visitors. All the best to you. Thanks for the strategies you talk about through this site.